THE SAINT-FLORENTIN MURDERS if the fifth in the Nicolas Le Floch series set in eighteenth century France. Nicolas, a special investigator and his assistant Inspector Bourdeau have been cooling their heels since the death of Louis XV, having fallen out of Royal favour. However the death of a chamber-maid at the home of one of the new King's ministers sees them back in business. Nicolas is of noble blood, albeit illegitimately, but his friend and colleague is of a more socialist persuasion. The initial crime has been set up so at to blame the girl's lover, the mansion's major-domo, however Nicolas soon realises it's an outside job. However before he gets too far into the investigation he's summoned first to his boss's office and then his ex-boss's and given a number of unrelated tasks to perform, and he begins to wonder if he's the only policeman in Paris. However these further enquiries gradually combine with the initial murder investigation as well as subsequent bodies that are found. The actual solution to the case is fine, with maybe a couple of loose ends left over, but it is the least satisfactory part of the book, which sounds like I'm damning it with faint praise - but the book is so absorbing in terms of atmosphere and historical detail that it would be hard for the crime plot to shine above it; it's the journey provided by the story rather than the actual story that I found the most captivating. Paris appears in all its glory and its degradation; Nicolas's lineage allows him to access to the highest in the land so there are scenes at Versailles and with the new King and Queen but he also has to visit a terrible hospital with awful conditions. The official executioner is able to provide a remarkably sophisticated, for its time, forensic service and though Nicolas is a decent man, and an able detective, he is hampered by the importance of some of the suspects who refuse to give alibis. As there are plot-lines ranging from curbing the spread of anthrax to discovering spies from England, touching on Digesting Duck automatons and what to wear in mourning, plus a large slab of internal politics, it's no wonder the book is over 400 pages. I haven't read the earlier books however a brief summary of Nicolas's upbringing is provided at the beginning. The writing style replicates an older, more verbose way of conveying information and for those who love food, there are detailed descriptions of meals and even sometimes how they are cooked. 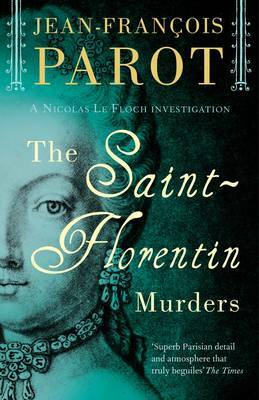 THE SAINT-FLORENTIN MURDERS is a fascinating read which I thoroughly enjoyed and I look forward to reading the next one, especially as the year of the Revolution is fast approaching.